Dexter Keith Gordon (1923-1990) was a U.S. jazz tenor saxophonist. Gordon was born on 27th February 1923 in Los Angeles. He became one of the first bebop tenor players to carve out a distinctive style. He matured into one of the major tenor voices in post-war jazz-- an original player who was perhaps the single strongest influence on the young John Coltrane. He ranks with Sonny Rollins, John Coltrane, Stan Getz, Joe Henderson, and a dozen or so others as one of the modern masters of the tenor saxophone. Gordon was born on 27th February 1923 in Los Angeles. He became one of the first bebop tenor players to carve out a distinctive style. He matured into one of the major tenor voices in post-war jazz-- an original player who was perhaps the single strongest influence on the young John Coltrane. He ranks with Sonny Rollins, John Coltrane, Stan Getz, Joe Henderson, and a dozen or so others as one of the modern masters of the tenor saxophone. 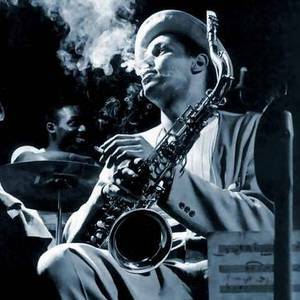 From 1940 to 1980, Dexter Gordon led his own ensembles and played with such jazz greats as Lionel Hampton, Tadd Dameron, Charles Mingus, Louis Armstrong, and Billy Eckstine. He also played with the Fletcher Henderson band in Los Angeles for a few weeks in 1947.